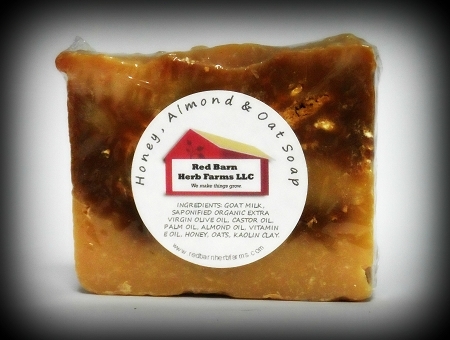 Gentle, super-moisturizing soap made with fresh goat's milk, organic sweet almond oil, raw oatmeal and fresh local honey. This heavenly smelling soap contains absolutely no essential oils or colorants of any kind. The magic happens during the curing process. Smells good enough to eat, but we don't advise that. Ingredients: Saponified Organic Olive, Palm & Castor Oils, Goat's Milk, Organic Sweet Almond Oil, Raw Local Honey, Kaolin Clay, Raw Oatmeal, Vitamin E Oil.